Special promotional launch – Pay only for the cards! Join this unique complimentary experience. We ask only for the $5.00 cost to package and ship the cards to you in the mail. At the end of your successful completion, $45.95 is refunded to you. The 60-day experience starts April 1st. Each day you will receive an invitation to engage the day’s offering. Joining a private Facebook group gives you access to Gayle’s presence, and other goodies including her hosting live Zoom video calls every-other Friday. Want to go even deeper with your money exploration? Then you are ready for the Online Game. 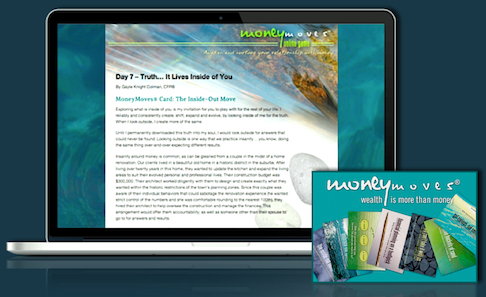 The MoneyMoves® Online Game includes a set of MoneyMoves® cards, mailed to you, and a 60-day friendly investigation into your relationship with money. Each daily offering includes a compelling money story, a lively online activity, wonder questions and homeplay invitations. Click here to visit an overview of each day. For our group launch, we have a very special offer. We want to give the game away! To ensure active engagement, we are requesting a deposit of $49.95, to be returned to you at the end of the completed course (less $5.00 for the packaging and mailing cost of the MoneyMoves® cards.) Your $44.95 will be returned to you at the end of the course via PayPal. If for any reason you desire to end the game and receive your refund sooner, we will accommodate that as well. Our intention for the unique launch offer is to provide a valuable experience for the participants, while receiving your genuine feedback about your experience at the end of the program. We value your feedback and that is our motivation to offer this complimentary course. If you feel committed and open to learning and sharing in this way, please join us. 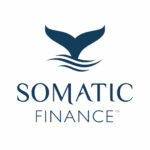 When you are purchasing this Online Game, please make sure that you are signed up for the Somatic Finance newsletter. This will ensure that you properly receive the daily emails from Gayle. There will be a checkbox during the checkout that will ask if you would like to sign up for the newsletter. Please make sure that it stays checked. In addition, please add gayle@gaylecolman.com to your contacts. This action should direct the emails to your Inbox. If you are missing daily offerings, please monitor your Junk/Spam folder for the emails. Be the first to review “MoneyMoves® Online Game with Gayle Colman: A Somatic Finance® Experience” Click here to cancel reply.